﻿ Matthew 6:19 "Do not store up for yourselves treasures on earth, where moth and rust destroy, and where thieves break in and steal. "Don't collect for yourselves treasures on earth, where moth and rust destroy and where thieves break in and steal. "Stop storing up treasures for yourselves on earth, where moths and rust destroy and where thieves break in and steal. "Do not store your valuables [here] on earth, where moths can eat them and where rust can corrode them, and where burglars can break in and steal [them]. 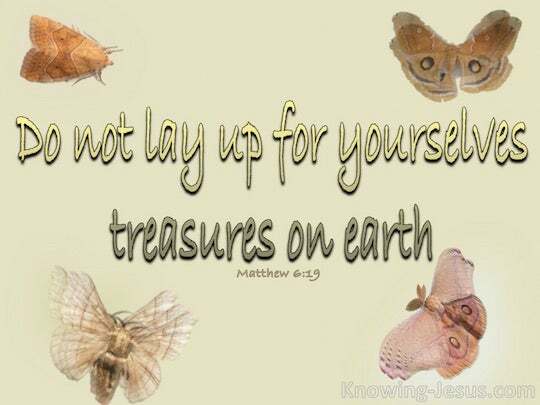 Lay not up for yourselves treasures on earth, where moths and rust consume, and where thieves break through and steal. Lay not up for your selves treasures upon earth, where moth and rust corrupt, and where thieves break through and steal. 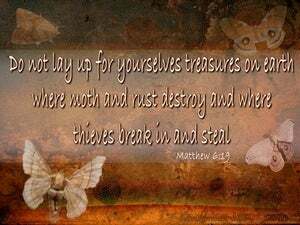 Do not lay up treasures on earth for yourselves, where moth and rust corrupt, and where thieves break through and steal. "Do not accumulate for yourselves treasures on earth, where moth and rust destroy and where thieves break in and steal. Lay not up for yourselves treasures on the earth, where a moth and corrosion destroy, and where thieves dig through and steal. Do not store up treasures for yourselves on earth, where moth and rust destroy, and where thieves break in and steal. "Do not lay up stores of wealth for yourselves on earth, where the moth and wear-and-tear destroy, and where thieves break in and steal. "Stop storing up your riches on earth where moths and rust make away with them, and where thieves break in and steal them.